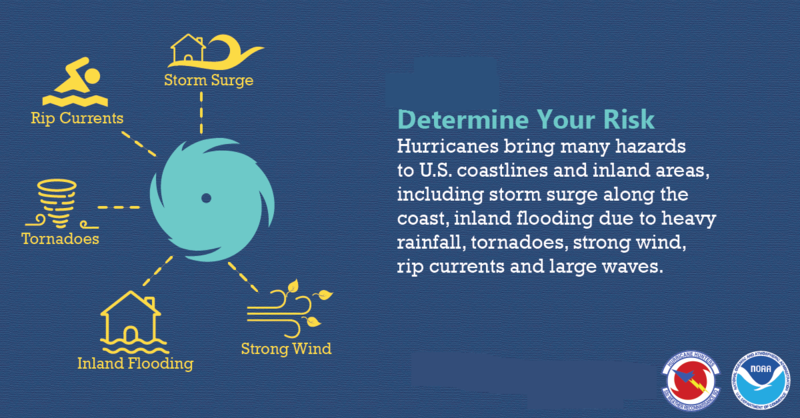 when it comes to hurricanes, What are you at risk for? While storm surge is largely a coastal problem, it can also present it self along major lakes (like Lake Okeechobee). Even when storms are located hundreds of miles away and don’t “hit” the coast, they can still pose significant threat through rip currents. For boaters, mariners and beachgoers alike, keeping informed on the tide & current information can be a matter of life and death. Don’t be fooled by a hurricane’s location.. be aware of rip currents during hurricane season! Tornadoes don’t occur just along the coast during a hurricane. They can form close to the center of the hurricane eye wall or can exist in the rain bands that extend off the center of the hurricane. Tornadoes post a threat within hundreds of miles of a hurricane due to the disturbance the hurricane is causing in the atmosphere. Even if the hurricane is not directly hitting your area, be aware of tornado warnings and have your safe room ready. Hurricanes are full of rain and often produce widespread, torrential rains in excess of 6 inches, which may result in deadly and destructive floods. In fact, flooding is the major threat from hurricanes for people living inland. Flash flooding, defined as a rapid rise in water levels, can occur quickly due to intense rainfall. Longer term flooding on rivers and streams can persist for several days after the storm. When approaching water on a roadway, never try to drive through moving water. It is best to turn around versus risking drowning. Rainfall amounts are not directly related to the strength of hurricanes but rather to the speed and size of the storm, as well as the geography of the area. Slower moving and larger storms produce more rainfall. While 75 mph winds don’t scare most Floridians, think about the damage they can cause. Would you want a pineapple, piece of wood or piece of glass flying at your body at 75 mph? Even the weakest hurricanes cause wind damage. Mobile homes and buildings that have not been built since newer building codes were enforced will still be affected by 75 mph winds. These buildings can product the flying objects that can affect your home or business. It is for this reason, you want to take measures to secure loose patio furniture, lawn decorations, trim trees and protect windows even for the smallest hurricane. We have 40 years experience and have seen it all. We put together this guide to help you serve your household the best you can. We want you to be successful. Reach us 772-567-4435 anytime of the day or night.